Water lines repair or replacement is considered one of the costly repairs a homeowner might face. Many people try to avoid water lines repair but ignoring this need of repair on time might snowball into a more serious damage of your property and bigger expenses. Even if the leak is seemingly harmless it should still be fixed as soon as detected. Numerous reasons can cause blockages and restrict your water line, which eventually will lead to it complete plumbing system damage. Most common causes of a water leakage are rusty pipes, and small underground tremors. Often enough water pipes get damaged during yard constructions, and unfortunately it only becomes evident the water rises to the surface of your yard. Diagnosing many water line and sewer problems can be very difficult and some may even resort to guesswork to find the problematic area. Many times water lines repair or replacement will mean tearing up your property and everything on it to get it fixed, which labor intensive not to mention cost effective. However, when you hire Metro Plumbing and Drains to do the job for you, you can be assured of 100% quality and efficiency. Experience in the plumbing industry is everything. Metro Plumbing and Drains has years of experience, and our expert plumbers are the best in this field. We have changed the way water lines repair or replacement is carried out and has made it much into a simpler process for our clients. 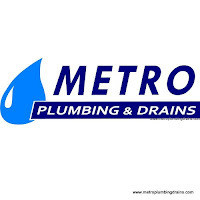 At Metro Plumbing and Drains, our plumbers will treat your property, with respect and care, meaning that no unnecessary property damage will be done. As mentioned above, water line repair or replacement may become costly, therefore our company will provide a free estimate and will guarantee an upfront price. Please note that our free estimates are only done from Monday to Friday between the hours of 9am to 5pm. We want to make sure that our customers fully understand and feel comfortable with the price and the service that they will be receiving. Our representatives will gladly guide through the process of the repair, and answer any questions.